An S&OP implementation requires many changes, not the least behavioural change. However, there are different behavioural change requirements during a journey to S&OP excellence. These behavioural changes often require coaching to be addressed properly. In four posts, four coaching phases will be explained to support leaders with behavioural change required to reach S&OP excellence. 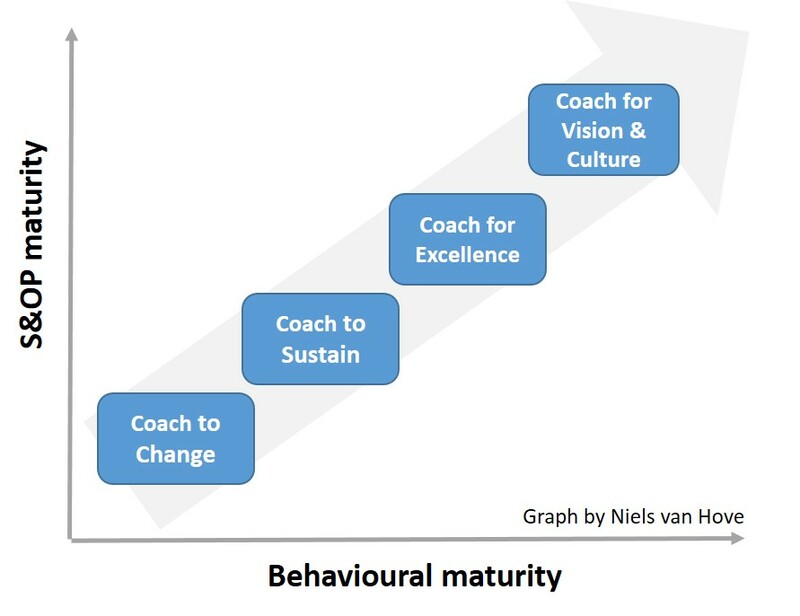 These are; Coach to change, coach to sustain, coach for excellence and coach for vision & culture. In this post; coach to sustain. Once you’ve developed critical mass of senior leaders and other S&OP stakeholders who support the process and behavioural principles, there is commitment to the process disciplines, meetings and data inputs and outputs. Basic S&OP behavioural principles like open communications, transparent data usage, public information sharing, conflict resolution, follow through on actions and cross functional cooperation will start to be common. To further cement these behaviours and make the newly build S&OP foundation more sustainable, two other core elements of S&OP need to be developed. 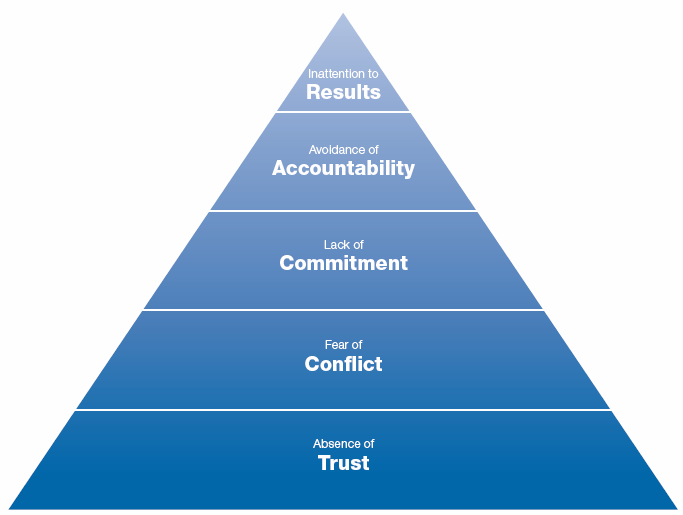 We need to coach to sustain and improve Trust and Communication. 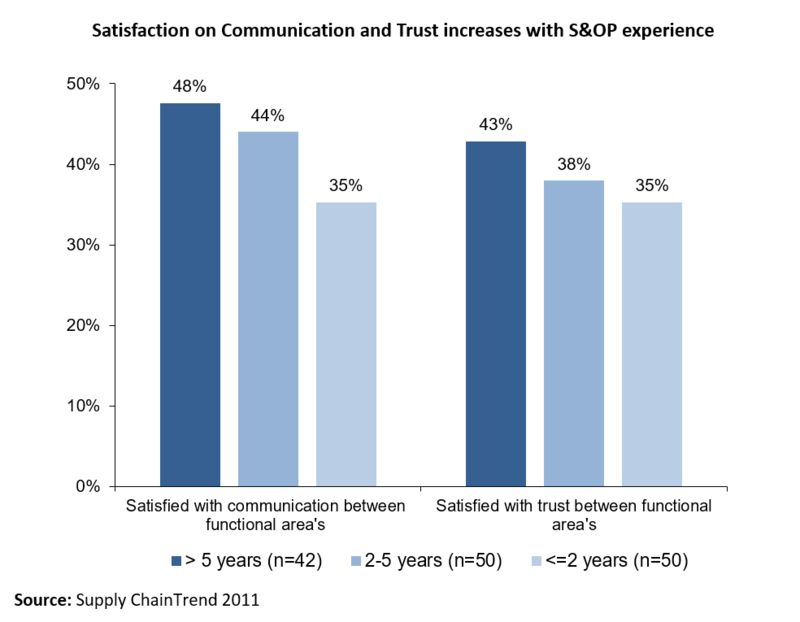 My S&OP Pulse Check shows that satisfaction on trust and communication increases slightly with S&OP experience. However, even with more than five years of S&OP experience, less than 50% of survey participant indicate they are satisfied with the levels of trust and communication. With less than 50% of S&OP stakeholders showing satisfaction in important fundamentals as trust and communication, an S&OP foundation remains fragile. To build sustainable S&OP, we need a critical mass of S&OP stakeholders who both display effective trust and communication behaviours and who are satisfied with levels of trust and communication between functions. When leaders display trust behaviors, they increase psychological safety, a shared belief where team members feel accepted and respected, and a study by Google of over 180 organizations reported that psychological safety is by far the biggest contributor to team effectiveness (Rozovsky, 2015). The latest research from neuroscientists focuses on eight measurable behaviors that most stimulate trust (Zak, 2017). Zak found that, compared to low-trust companies, people at high-trust companies report 74% less stress, 106% more energy at work, 50% higher productivity and 29% more satisfaction with their lives. 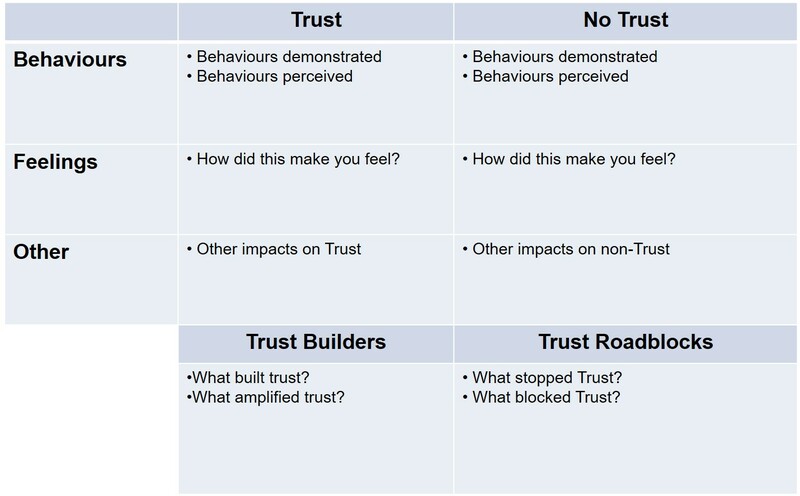 Building trust doesn’t happen overnight and there are many ways to improve trust. What follows are some examples I used to build trust in a business. A coach can use these initiatives to make S&OP more sustainable. For any initiative to be effective it is important that the most senior leaders not only show their support, but also walk the walk and talk the talk. The ultimate goal of S&OP is the generation of a plan to support an organization’s efforts to deploy and execute its strategy. Communication is of vital importance for S&OP and strategy execution. As John Kotter indicates in his 8 steps for successful change, ‘communicating the vision clearly and often’ is vital for change management. A McKinsey report from 2015 considers communication to be one of the top three impact factors on business transformations, resulting in a four- to eightfold greater transformation success rate. Information flow is considered the strongest contributor to good strategy execution (Neilson & colleagues, 2008), and there is statistical evidence that poor communication and misaligned information flow are directly correlated with poor strategy execution and decreased profit (Radomska, 2014). Vertical communication gives direction and context to the business. A new market or new business reality needs to cascade down to the lowest level of the organization to ensure that a critical mass of employees understands and supports the new direction. Beer and Eisenstate (2000) mention poor vertical communication as one of six strategy killers. With globalization, mobility, flexible work places, and social networks, informal communication has become a significant factor in strategy implementation (Radomska, 2014). S&OP participants indicate to me year over year in The S&OP Pulse Check that the main reason to implement S&OP is ‘to improve cross functional communication’. They also indicate that the main cultural change is ‘better understanding and communication between functions.’ Communication needs to be improved vertically, horizontally and informally. However, according to practitioners, S&OP is first of all about improving horizontal communication and consensus between functions. To improve horizontal, vertical and informal communication, we have to train and educate employees to give them a proper communication tool set. Furthermore, we can coach them to take away any individual obstacle that holds them back from communicating effectively. What follows are some communication skills I learned and applied over the years. A coach can use these to make S&OP more sustainable. Build Confidence: Confidence is a measurable and developable attribute of Mental Toughness. It exists from interpersonal confidence and confidence in own abilities. An individual who scores high on interpersonal confidence will feel confident to cross the functional silos pro-actively to communicate. They will also feel confident to vertically communicate with their leaders or challenge their peers in a constructive way to get the real issues on the table. They also have the self worth to have informal conversations. Crucial Conversations: many individuals prefer to avoid the tough conversations. That’s why in business often critical issues are not addressed and solved before things escalate. Confidence can be build and techniques can be learned to have crucial conversations, whilst keeping your emotions in check. Develop curiosity: Develop a growth mindset and appreciate to learn and discover new things. Develop curiosity to seek to understand before being understood (another habit from Covey) and discover new angles and possibilities that would otherwise stay under the surface. With all the world’s workshops and training on trust and communication, many individuals will still find it hard to apply their learned skills. For example, an individual with a lack of confidence will find it harder to communicate across functions or provide feedback to a peer or manager. This person might also find it hard to display trust behaviours like talking straight, displaying transparency or have crucial conversations to solve issues. Interpersonal confidence is an attribute of Mental Toughness and can be measured on individual and on team level. Like many personal traits, confidence can be improved and in this case could have a positive impact on trust and communication in support of S&OP. These types of interventions require more than simple training. The require advanced coaching techniques and coaching for self-excellence. Coaching on other personal traits and behaviours can help improve strengths or unlock hidden potential and helps an individual be the best version of themselves. The next post in this series, coaching for excellence.